Along the area known as the Etna Circuit (Circuito dell’Etna), on the coastal part between Catania and Messina, is where you will find Acireale, a locality that boasts ancient foundations, which could be confused with the myth of Aci shepherdesses and Nereide (sea nymph) Galatea, sung about by Roman poets Virgilio and Ovidio: Aci was a love rival of Polifemo. The story tells of how Aci would have been crushed under a boulder and his blood gushing out would have created the Akis river, also known by the Greek colonies, arriving here instead during the VII century BC. During Roman times, it was known as Aquilia, and had a prominent role during the Punic wars against the Carthaginian general, Hannibal, and also during the Civil War of 37 BC, where it saw a naval clash between the Ottaviano Augusto fleet and Sesto Pompeo Magno, the son of Pompeo. After the period of Barbaric invasions it stabilised and became part of the Byzantine peninsula estate, where the castle of Aci was constructed, the future nucleus of the modern day habitation. During the 9th century, the whole of Sicily was conquered by the Arabs and later by the Normans in the 12th century. Following its destruction by an earthquake in 1169 and the eruption of Etna, its inhabitants founded Aquilia. 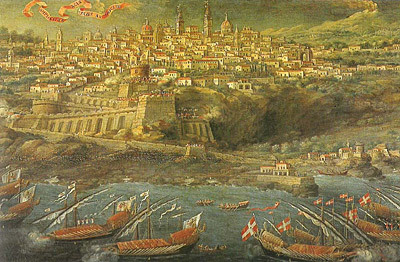 Although new, the modern Acireale was formed as a result of the siege by the fleet of King Robert of Naples in 1326, which determined a move by its inhabitants to the Byzantine castle area. In 1642 the City became known by its present day name under the regency of King Phillip IV of Spain. The city was destroyed by an earthquake in 1693, then rebuilt once more only at the end of the 19th Century with the construction of the first thermal establishment and subsequent birth of the modern tourist industry. Fulcrum of a visit to Acireale is the Cathedral of Annunziata and S.Venera (1597-1618), where you can find the Cathedral of Saints Peter and Paul ('600), the town council building (Palazzo del Comune -1659) side by side in its public square and protected Palazzo Modò ('600) which looks onto the square. You must not miss a visit to the Villa Belvedere gardens with its splendid panorama overlooking the Ionian sea.